The first trip with Blue Planet 1 was in 2018 in 28.06 - 05.07. The trip was excellent. We did the route North and Tiran. The Boat is small compared to others but is fully equipped with all facilities. There are rooms in the lower deck accessible from the diner room and 2 rooms in the upper deck with sea view. The dive guide Ashraf is always very professional for presenting the dive sites, safety measures and also to show various fish species during the dives. On this route there are night dives every day and the trip in total is 21 - 22 dives. On the last day there are two morning dives. The boat has room for 15-16 guests I believe and this is why it is better for smaller groups and to avoid crowded dives. There are also two zodiacs used for accessing the farther dive sites where the boat cannot moor. Sometimes dives start and end from the boat and sometimes they start from the boat and end by zodiac. Anyway, the crew is very helpful and assist you to get your gear on the zodiac and also yourself. Also, they help you put your fins on when diving from the boat. The food was excellent. I never had issues with any ingredients. There are plenty of varieties to chose from on every meal. The water, soft drinks and instant coffee is free, you only pay for extras such as Nespresso, beer and wine. You can also rent equipment but it is better to notify this in advance to the crew. I will return for sure with Blue Planet 1 and the other boats of the fleet. I would like to mention the kind assistance of Teresa from Divebooker and her colleagues, who was very helpful and professional with organizing the whole trip and the various details regarding the rental of equipment, transfers from airport to the hotel and boat. Very nice dive trip to wrecks and highlight with Doplphins. Very nice dive guide Hassan. Obly 7 divers on the trip. It was a very individual tour. 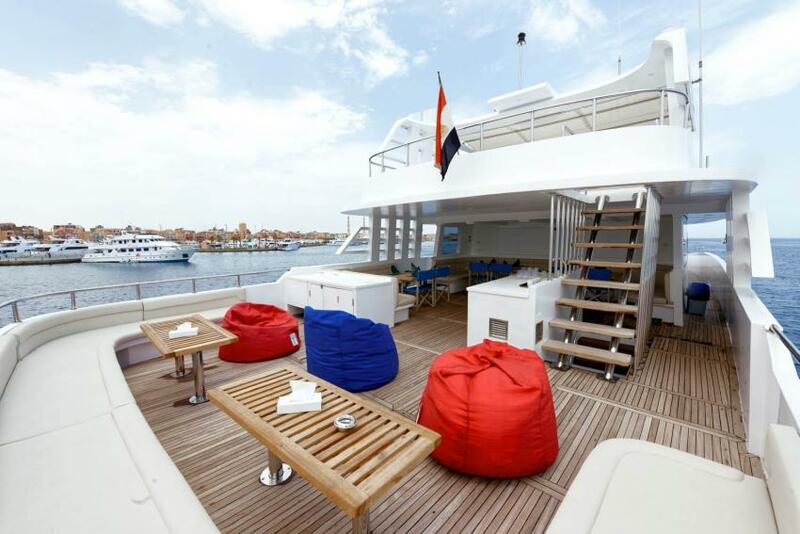 The Blue Planet Fleet owns and operates 4 Liveaboards in the Red Sea: MY Blue Planet 1, MY Blue Pearl and MY Blue Seas. Discover the best coral reefs in the world and see one of the world’s most mesmerising marine environments, flourish nearly every species of coral and incredible fish life. Professional dive team is always friendly, helpful and ready to take care of you on your new Red Sea adventure holiday. All of the diving equipment, tanks and diving gear are manufactured by trusted professional brand name scuba diving manufacturers. The gear is meticulously maintained to ensure your comfort and safety. The main priority on boats is your safety and comfort. Chiefs cater for vegetarian and non-vegetarians, the team is aways ready to respond to any other special needs you require. Find & book your ultimate dive holidays of a lifetime today.